The 10mm cartridge is seeing more popularity now than ever before, and just about every major handgun manufacturer offers a pistol chambered in the big 10. However, if you look at the cartridge itself, you’ll see it seems perfectly suited for use in a carbine-length barrel. The strong recoil will get muted when fired out of a long gun, and you’re likely to see some impressive velocity gains when firing this powerful pistol cartridge out of rifle-length barrels. 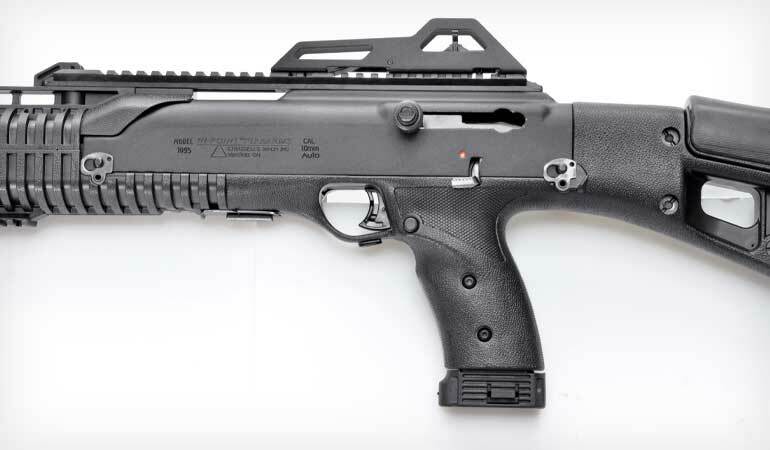 Enter the Hi-Point 10mm carbine. Technically the 1095 TS, it sports a 17.5-inch barrel, is 32 inches long and weighs seven pounds empty. The operating system is straight blowback, which is both simple and reliable. 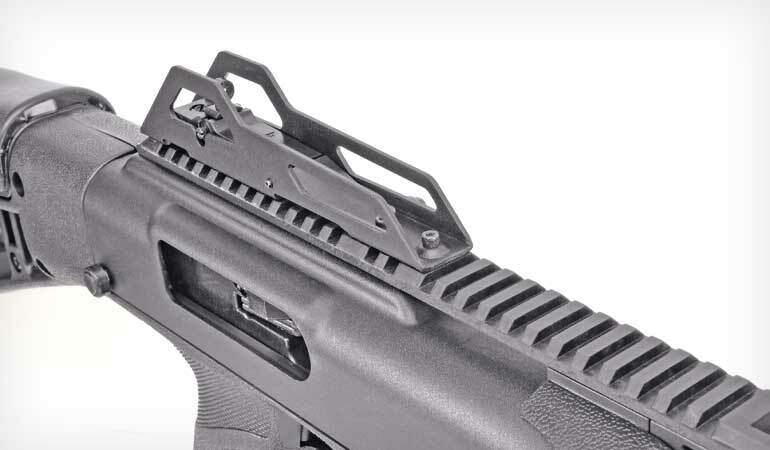 The carbine’s charging handle is on the left side, and the magazine release is a pistol-style button behind the trigger guard. It is fed by a proprietary 10-round magazine and has a pistol-style magazine release in the grip. It features a rear peep sight and a post front, and it also has a polymer rail atop the receiver to mount an optic. Right now the 10mm carbine is available in two color variations: the ever-popular black and Realtree Edge camo. I had an opportunity to fire late prototype models of this carbine, and I noticed one change in the design between those prototypes and the production model I tested for this article: the addition of a soft rubber cheekpiece on the stock. 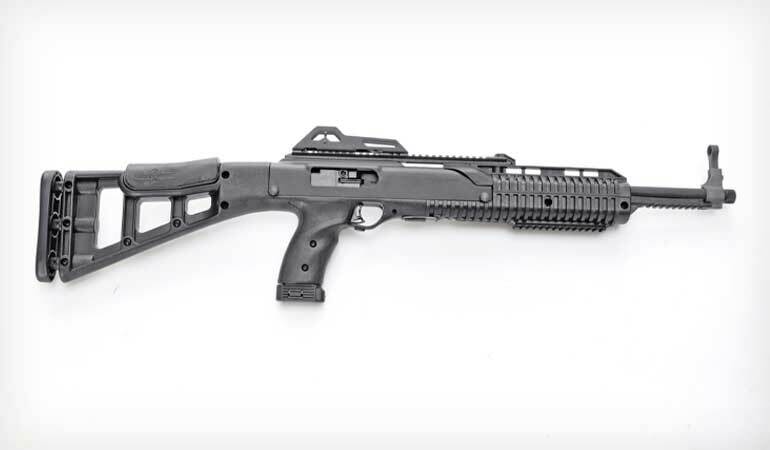 Hi-Point carbines operate via straight blowback, and the recoil of the 10mm cartridge can get a bit snappy. In the Hi-Point that translates to a bit of a bump/jump against your cheek every time you fire a shot. The new soft rubber cushions your face and takes all the discomfort out of the equation. It’s so soft it’s almost tacky. There is also a spring-loaded recoil buffer in the stock to absorb even more of the bump. The bolt locks back on an empty magazine. Each carbine is supplied with one magazine, but Hi-Point graciously sent me two for testing. I like taking my two sons with me to the range when I’m testing firearms, because if there’s a unique or unlikely way to break or jam a test gun, they’ll find it. 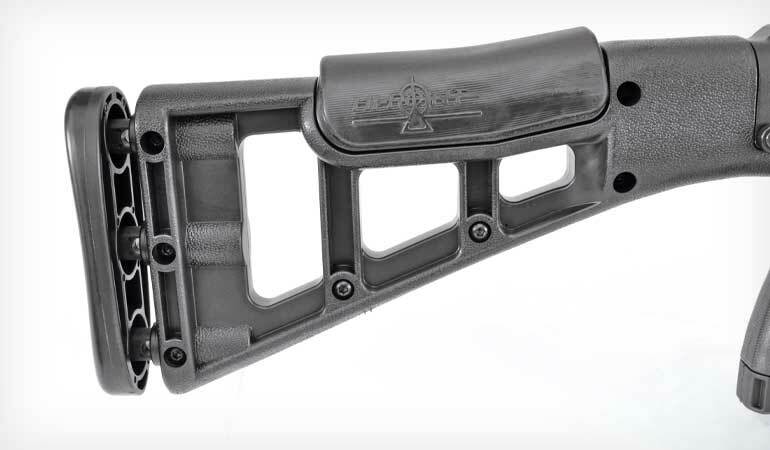 The stock has a soft rubber cheekpiece to take the sting out of recoil, as well as a spring-loaded recoil buffer in the stock to absorb even more recoil force. In the case of the 10mm Hi-Point, my older son loaded both provided magazines…with .45 ACP ammo. Fortunately, the mistake was noticed before either of the magazines made it into the gun, but the experience showed me the 10mm mag bodies are the same width as the .45 ACP mag bodies, only with different feed lips. The only complaint I’ve heard about these carbines from fans is they are difficult to disassemble for cleaning. If you want to do more than just run a rod down the bore, you’re going to have to first read the owner’s manual and then remove some pins and screws before you can pull that bolt out. Luckily, straight-blowback guns run forever even when dirty. I have extensive experience with all calibers of Hi-Point carbines, and without exception they have all been boringly reliable. Its carbines have always been steady sellers for Hi-Point, but the 10mm is flying out the door. The company is selling them as fast as it can make them. And there’s a reason for this. The rear sight is a protected peep, and there’s also a polymer Weaver-style rail for mounting optics such as a red dot sight. While the 10mm cartridge is seeing a resurgence in popularity, your choices in 10mm carbines are slim. Likely the only ones made by companies you’ve actually heard of are the KRISS Vector, with prices starting at $1,519, or this Hi-Point, with a suggested retail price of $389 ($439 for the camo version). Even victims of public school math classes will notice that price difference. While knocking steel down with great authority at the range, my kids remarked how they liked the iron sights of the carbine, although now that they’re older (20 and 16), they don’t like the looks of the carbines as much as they once did. I will admit that the looks of Hi-Point carbines aren’t for everyone. But they run and run and run and are priced to be affordable no matter your budget. They’re practical, too. Out of the carbine’s 17.5-inch barrel the 10mm cartridge has some serious oomph and will give you between 50 and 200 fps more velocity than advertised out of pistol barrels. That makes it powerful enough for hunting whitetails and smaller game inside 100 yards or so—as well as a viable option for self-defense, especially if you mount a red dot on the carbine’s optics rail. And, of course, since the barrel is threaded you could easily add a suppressor for hunting or home defense.